How do I power on my Razer Nommo Chroma? Press on the volume knob until you hear a click to switch on your Razer Nommo Chroma. How do I position my Razer Nommo Chroma for best sound results? The Razer Nommo Chroma satellites should be placed equal distance on the left and right with you in the center. Each satellite should be angled to face you directly for optimal sound projection. How do I get the best possible sound settings for my Razer Nommo Chroma? 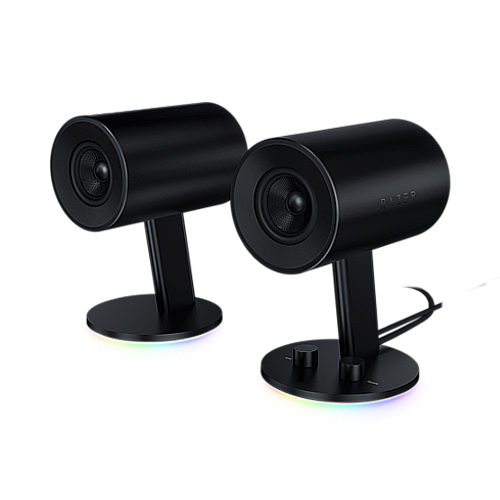 The Razer Nommo Chroma features independent volume and bass knobs. Adjust the level of each until you get the sound you like. Can I fine tune the EQ settings on my Razer Nommo Chroma? The Razer Nommo Chroma has been designed to give you optimal balance of sound without the need for fine tuning your audio. If you desire greater clarity and lower bass, please try to adjust the level of your bass knob to a desirable level. Can I use my Razer Nommo Chroma with other devices besides my computer? You can use the Razer Nommo Chroma with any devices that have a 3.5mm output jack for audio be it on your computer, TV or mobile phone. Why is the audio output soft when aux input is connected? Make sure USB source and/or aux input is connected to your source device. Also make sure that you do not have any device plugged into the headphone jack. Can I connect my Razer Nommo Chroma via the 3.5mm jack as well as USB port to my PC? We do not recommend this unless the aux input is connected to a separate device as a secondary audio source. Both audio sources will be mixed together. You can for example connect your mobile phone to the speaker if you wish to play music from your mobile device instead of your computer. I can't control the Chroma lighting on my Razer Nommo Chroma. Control of Razer Chroma lighting on your Razer Nommo Chroma requires you to download Razer Synapse 3. From here you will be able to customize your Razer Nommo Chroma to a similar degree as every other Chroma-enabled Razer product. What are the warranty terms for the Razer Nommo Chroma? You may find out more information on the policies for Razer Nommo Chroma here. How do I request or purchase replacement parts for the Razer Nommo Chroma?